LED 2x2 lensed troffer grid light fixtures with 2 - LED lamps. LED 2x2 lensed troffer light fixture with 2 - LED lamps is an office light shape you may be familiar with but more energy efficient than ever. This is a USA made product and came with the LED light bulbs. It's a universal voltage of 120 to 277 volt which automatically senses the voltage you have and works properly. If you have offices where high productivity at a reasonable cost is needed, then this 2x2 grid light might be a good solution. 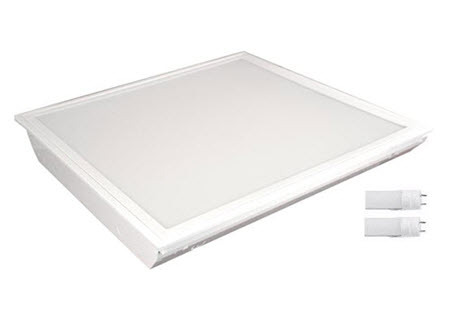 The 2x2 LED lensed troffer is usually not used throughout an entire office space, but rather as a way to complete a ceiling grid, so it has a similar spacing. They install the same as standard light fixtures, and these have 2 LED lamps inside the fixture for an even light across the face. For those of you who want maximum energy savings in a 2x2 light fixture, then this might be the solution for you. You will still get excellent light output in a very even light throughout the office space, but you will be only using 30 watts. And for many situations that use this light, that may be enough to light the area that these are typically put in. It has a five-year warranty so you're going to be protected against early failure and it comes with the lamps with a choice of color that you decide. You can have anything from a warmer incandescent color light do something that's more like full spectrum daylight. In any case, you're going to get good lighting while still saving the most energy you can add that means you'll get a faster payback. If you're unsure whether you should use this a lower wattage version or something that's a little bit higher, we can help you determine that by giving you a typical layout that will show footcandles that you would get with this light fixture. Housing is die-formed and embossed from cold rolled steel. Wiring access plate and knockouts are provided on the back of housing allowing for flexible greenfield attachment. Driver cover snaps easily into place eliminating the need for tools when accessing the driver. Prismatic lens is held within a hinged steel frame door. The heavy gauge door frame hinges downward on either side and is contained in the closed position by two positive cam latches. Knockouts are provided on ends for continuous wiring. - Dimension: W = 23.75" x L = 23.75"
- CETLUS listed for damp location. General information about LED 2x2 troffers. At BuyLightFixtures.com, we want you to have the best quality light fixtures for any commercial office lighting possible. 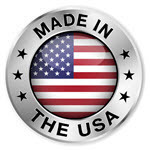 That’s why we carry many types of drop ceiling lights are made in the USA. The build quality is better than the imports, and we have a price that’s very competitive with all of those. There’s never been a better time to upgrade your lighting to something that is not only going to give you excellent illumination but also going to provide you with the least amount of energy use possible. We strive to help all our customers reach those goals when considering a new lighting arrangement. These are LED lights that replaced the old fluorescent troffers used in the past. These are the ones with the prismatic lens typically, and they were used for many decades as an effective way to get a good light spread over a larger area. A low cost was always the consideration when specifying this type of lighting. With the advent of better lighting through LED implementation, were getting all sorts of different kinds of lighting that improves upon the pure form of prismatic lens variety. Of course, those are still available, and we believe that there are many occasions where that still what people like to use because of its low cost. Many of you are probably considering this type of LED 2x2 fixture because you're going to put it in a grid ceiling, existing or new construction. Offices everywhere continue to use this style of drop ceiling grid and will continue to use it far into the future. There are several things to consider when replacing a u-shape T8 32-watt fluorescent fixture; you need to make sure that you’re going to have enough light with the LED product you’re thinking about choosing. For most type of fluorescents, they can be replaced with roughly half the wattage of LED and still maintain light levels. It's a general rule of thumb although each situation could be different and it depends a lot on the room that it’s in and the task. There are several things to consider when looking for the right light. One of the primary considerations in new lighting is energy savings and how much you can save in real dollars having a good payback for your investment. There’s never been a better time to consider going to something that’s more energy-efficient in 2x2 LED troffers because there are so many choices that will accomplish that energy reduction while getting something that looks a little bit better. That’s why we call these lighting retrofits, a lighting upgrade. If you’re unsure as to how much money you can save, we have a simple lighting payback spreadsheet that you can download from the left-hand column of our website. It gives you everything you need to compare an existing lighting system to one of our more efficient LED 2x2’s. All you have to do is input your current data for the troffer fixtures you may have now, comparing them to the new system with less wattage draw. Not only do we have a figure in there for energy savings but it will also calculate the payback, the time it takes to recoup your investment through energy savings. There’s also a figure that you can use for maintenance savings; all this put together can get you a swift payback. And if your electric utility has incentive programs for people upgrading their lighting with something more energy-efficient, you can see that go down even further. The return on investment on energy-efficient lighting is excellent these days, and it’s something to consider to reduce the cost of running your business or office. Another consideration that people need to take into account when changing over to new LED 2x2 troffers is color temperature. Sometimes people think it’s not that important then they will say that you can give me whatever you think is best, but we don’t like to do that. It’s an individual choice whether you want something that’s going to have a warmer color appearance or something that’s going to be a cooler color. And a personal preference can reflect on how well office functions. You want to make sure that people are pleased with the color of light if you don’t have that you’ll get people grumbling and may be using it as an excuse for not getting things done. Typically the warmer color is something around 3000K; cool white is about 4100K and daylight is 5000K. Most people that use these in a home might be looking at something that would be the warmer color temperature because it works so well with different kinds of earth tones you may have in a house. A lot of businesses though prefer the 5000K daylight color because it’s so good with black and white contrast, reading and visual acuity. These are all things that will help people be more productive, and that will assist in making that happen. Call us if you have any questions about these LED 2x2 troffers or anything else you see on our website. We want to help you get the best lighting possible, and we have many years of reliable expertise in working with commercial and industrial customers, retail, home users, electricians, and general contractors. We can help you get the right lighting for the least amount of money. We should also say that if you have a more significant quantity that you need to order, call us for a single quote and will get that to you. We want to be your lighting supplier and believe that we do have some of the best products made in the USA for your next lighting project.